Matthew Stafford isn’t often mentioned when NFL fans inevitably argue over who’s the best quarterback in the NFL. The Detroit Lions starter is often overlooked despite throwing for more than 4,000 yards in each of the past five seasons. Stafford made a further case to be included in the argument Sunday, when he broke the NFL mark for the most passing yards in a quarterback’s first 100 games. 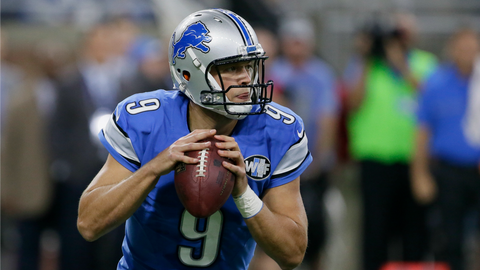 Stafford has thrown for 27,890 yards with 177 touchdowns and 102 interceptions. But Stafford isn’t just putting up passing numbers. He orchestrated his 24th game-winning drive in the fourth quarter or overtime Sunday, helping the Lions win their third in a row. Stafford is off to another quick start this season, tied for third in the league with 14 touchdowns despite no longer having Calvin Johnson to throw to. But despite his individual excellence, Detroit has made the playoffs just twice in his first seven seasons in the league. Until Stafford proves he can lead the Lions to playoff success, he won’t be mentioned in the same breath as Tom Brady, Russell Wilson, Drew Brees, Aaron Rodgers, Ben Roethlisberger and the other star quarterbacks in the league. But his knack to come up big in the clutch — like he did Sunday by throwing the game-winning touchdown with 16 seconds left to stun the Redskins — proves he has the makeup to shine brightest when pressure is on. Will he eventually show off that fearlessness deep into January? Lions fans hope this is the year.